Welcome to Nestaway’s Brokerage page. Here we offer trade-in, second hand, ex-demo and display boats and equipment for sale. NB We try to update this list as soon as a boat is sold, but please contact us for latest information and availability. All items are located for viewing by appointment at our premises in Christchurch, Dorset unless otherwise indicated. If you want to sell your Nestaway, or indeed any other boat up to approx 16ft, we have a good track record and the facilities to undertake any repairs that may be needed prior to sale. Brokerage rate 8% (£300 minimum) plus VAT. – Nautiraid Grand Narak 550 TourExp, red. This 5.5m two-person folding kayak, built 2017, is generally in excellent condition with one unfortunate small puncture, professionally repaired (you probably wouldn’t notice it if we didn’t point it out). The “TourExp” specification means it has the beautiful varnished ash wooden frames, with aheavy duty black PVC hull and a red deck with Nautiraid’s expedition fitout. Also included is a two-person spraydeck and two sprayskirts – all complete and ready for your next adventure. In the right hands this is a very capable boat and could be (they have been) taken anywhere from Indonesia to Antartica, but would also work perfectly well for day trips on the Thames… This fantastic folding kayak in this specification would now be the wrong side of £4000 new, owner is asking £2950. If you’re interested in any of those please give Ian a call on 07768 600595 for more information. 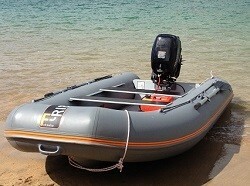 F-RIB 360 with Suzuki 9.9 and 2.5hp outboards (may separate). This package was bought by a very experienced customer who wished to operate what he knew was going to be his last boat on both inland waterways, where the speed limit is typically 4mph or less (hence the small light 2..5hp) and the sea (hence 9.9). Time and health constraints have meant that while he’s had it a couple of years the total running time (carefully logged) has been slightly less than 5 hours! So he’s decided to move it on. Also included are transom wheels, a folding launch trolley, a 12V inflator, and seat cushions (with bag underneath one of them). All in very good order, not new but really very little used and very well cared for. Price new for this package would be over £6000, customer asking £4500 ono. NAUTIRAID CORACLE 250. (Generic picture.) A 2015 boat, originally bought as tender to a larger boat during a year-ish voyage. That voyage is now over, the bigger boat’s sold, and the owners have no further use for their much-loved tender. It has been well looked after and at first glance of the top/interior you might almost think she was new. The bottom of course has more marks and scratches, but nothing structural and nothing in fact that a few hours with sandpaper and varnish would not reduce to slight blemishes of history. She has the longer oars and metal rowlocks that we often fit to UK boats as an option, making the total price for an equivalent boat new £2410. Owner is asking £1900, offers considered. 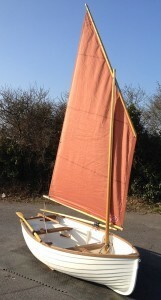 SOLD Nestaway Pram dinghy with spritsail rig. Built 2009 – now being sold due to requirement for larger tender. An early Nestaway Pram (hull #004), but if anything that means it was overbuilt and is almost indestructible! She has woodwork in teak, removable longitudinal seat in stern section, teak-deck style seats, bilge keels/handles on stern section, and our 36sqft spritsail rig (same area but different shape, compared with current lugsail rig option). Well used but also well below half the price for an equivalent one new… Inevitably she has some signs of use, but nothing that affects her usability – cosmetic scratches and dings, that could do with some filling and fairing if you want her to look her best. The woodwork is teak so in no danger of structural deterioration, but again could do with a light sanding and oiling to look its best. The spars definitely need sanding and re-varnishing. Asking £SOLD. 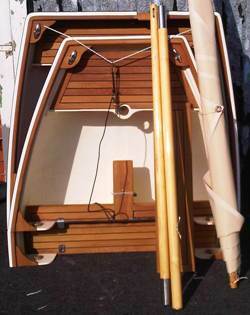 SOLD 2013 Nestaway 8ft Stem dinghy (non-nesting). A very rare vessel, this Nestaway clinker 8ft Stem dinghy is one of only two ever built with a single-piece hull (ie a “normal” boat!). Specified by a very experienced boat owner who fell in love with the look of our boats, but didn’t need the nesting, she has woodwork in teak, and a very fetching dark green hull. 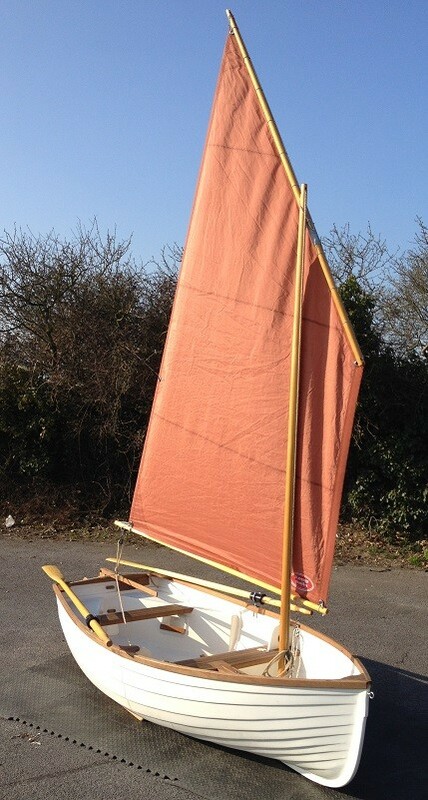 For Swallows & Amazons-style adventuring she has our 36sqft lug rig, with a tan sail and varnished wooden spars. Practical day-to-day features include fold-up/down/removable transom wheels, rubber fendering on the gunwhales, brass strip on the central and bilge keels, a rowing footbrace, and even a sculling rowlock aft. Overall she is a lovely boat and whilst there are a few cosmetic signs of use (minor scratches etc) she is generally in very good condition with a long life ahead of her. The sailing rig especially, is in immaculate condition, barely used. A sister ship built to the same specification new would be pushing on towards £4000; owner has reluctantly come to the end of his boating career and asking £NOW SOLD. 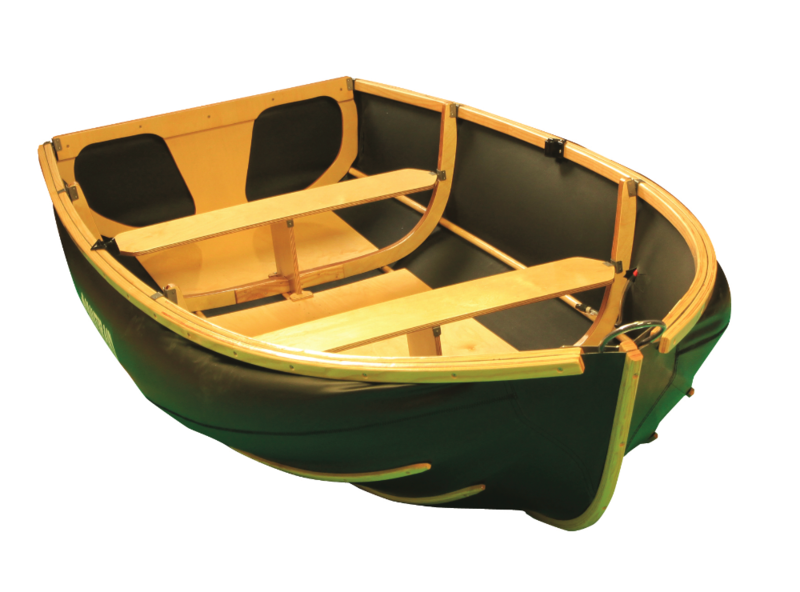 SOLD 2015 Nautiraid Coracle 190 6ft folding dinghy (generic picture). Bought late last year, the owners have decided after a few months’ light use that it’s “lovely but not quite big enough” for their particular needs. This, the 190/6ft model is perfect for one person, and fine for two, but really not much else in the way of luggage, dogs or children. It’s the usual Nautiraid high quality Hypalon skin, over varnished ash longitudinals, with varnished beech plywood removable cross-frames – just as they have been for longer than anyone cares to remember (the same basic boat has been in production since 1936!). Its main advantages are compact storage size and light weight, see our Nautiraid Coracle page for more info. This one is in excellent condition, showing only minor signs of use ie cosmetic scratches. Asking £1450. Built 2011, one owner. 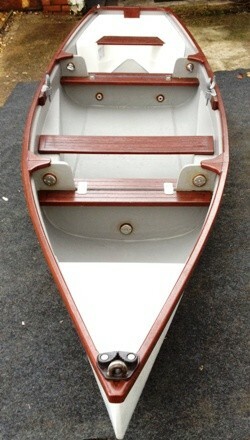 This is a good solid example of our most popular nesting boat, the 9ft Stem dinghy. There are of course some signs of use – cosmetic marks, scratches and a few minor dents – but everything you need is there and she’s ready to go right now (ie without the waiting list for a new one). Spec includes teak woodwork, teak-deck style thwarts, metal rowlocks with 7ft varnished wooden oars, brass keel band, bilge keels/handles on stern section, and a 36sqft lugsail rig with wooden spars. She also has a non-standard but very useful large hatch in the bow buoyancy tank – somewhere to put your sandwiches, as the current owner puts it. 2014 boat. This is a rare example of a used DinghyGo 275 on the market. 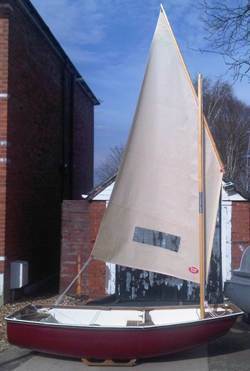 As with all DinghyGos it’s sold complete with the sailing rig, and in this case was also specified with the kick-up rudder. The sailing rig is in excellent condition, and the hull in very good condition apart from one mark caused by an unfortunate cigarette incident (cosmetic, does not leak). Asking £1850 including a useful folding launch trolley (fits in a bag, price new £150). A rare opportunity to acquire a professionally-built, brand new, example of Danny Greene’s much sought after “Chameleon” 10ft two-piece nesting pram dinghy. 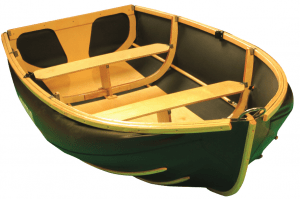 These have an excellent reputation amongst long-distance sailors as a versatile tender that can be rowed, sailed or motored, and fits in half the space of a conventional hard dinghy (nested length is just 5ft 4″). They have great carrying capacity, can be rowed to windward in conditions when most inflatables (even with a motor) have given up, and are described as a “hoot to sail”. Most Chameleon dinghies are home-built and often using DIY-store materials – this one is (very) different! The hull is constructed from Robbins Elite marine plywood, sheathed in West epoxy and glassfibre, painted throughout in Jotun-two pack. On first glance most people assume she has a moulded glassfibre hull. 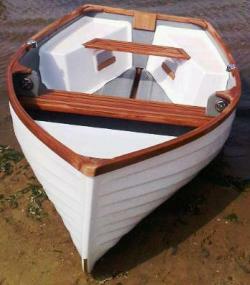 The wood trim – gunwhales, knees, centre thwart etc – is genuine teak. The two halves of the boat are joined together by 1/2″ chromed bolts (as used on our production Nestaway boats) with large handles built-in – so no tools are required – and captive threaded fittings so there are no nuts to lose. We doubt many Chameleons have been made to this standard, and quite probably none have been made to this standard and sold new (this one has been in the water once). We built her to evaluate “epoxy ply” as a construction method and whilst we appreciate its good points – light, strong, easy to maintain – sadly had to conclude that it’s not really viable in the dinghy market. The materials bill was just under £1500 and we don’t want to think about the hours that went in (definitely more than the 100hrs quoted by the designer)! Somebody is going to get a really nice boat for well under the (professionally-built) replacement cost. Included are the two halves of the boat, a removable longitudinal seat for the stern section, rudder blade and tiller, daggerboard and daggerboard case. Mast, sail etc not included but we could supply at additional cost. Built by us in 2009, this early Trio 14 is in remarkably good condition for a three year old boat – a credit to her single owner from new, with only cosmetic scratches on the bottom to reveal that she has been used. – fitting of galvanised rowlocks to centre section, with load-spreading wooden pads. A pair of 6ft, two-piece, oars are part of the deal. – coating of the (teak) woodwork with mahogany-stain varnish. This is why the wood appears darker than standard, not in any way offensive but could be removed if you wanted to bring it back to a bare wood or oiled finish. She has teak woodwork and the teak deck style (stripey) seats, but is otherwise a very “standard” Trio 14. However as this model is still in full production we could retrofit most options – from keel band to sailing rig – if you want us to, at additional cost. 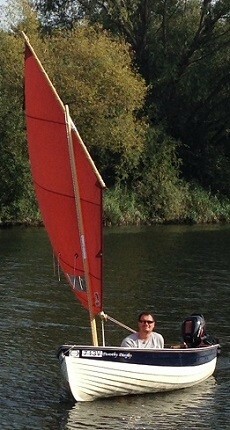 NYB12 GRP Nesting Pram Dinghy, Standing Lug rig. This burgundy-hulled boat was built for Southampton Boat Show 2011 and has also been on display at three other shows, but has never been in the water. With her dark red hull and extensive use of teak she would make a very distinctive “tender” to a yacht or camper van, or of course can be used as a fun (and easy to transport/store) dinghy in her own right. She has a few cosmetic scratches but the main reason we are selling her is that we have now changed the appearance of the decking on the buoyancy tanks, so this boat is no longer “current” for us. 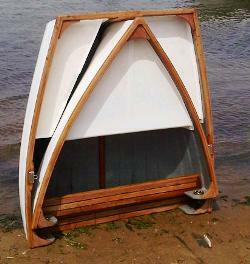 This is our exhibition Trio 14, built for Southampton Boat Show in September 2011. We like to renew our show boats each year, so whilst she has a few minor cosmetic scratches etc, she has never been wet (other than rain!). – “Rig Ready”; so to add sailing rig would be easy later if you don’t now. A Trio 14 built to this specification new would cost approx £3900; we are offering at £3300 (15% discount, and no waiting list). This boat was built April 2011 for stock – she has been to a few shows for display purposes, and in the water perhaps three times. She has the lighter weight foam-cored hull, with Kevlar outer skin and carbon inner, making her approx 30% lighter than a standard glassfibre Trio. Options include teak woodwork, teak-decked buoyancy tanks, keel band and bilge keels, pop-up cleats, etc. A sailing rig is not included but could be fitted at additional cost. NB RARE OPPORTUNITY! This was one of the very last carbon Trios built. In June 2011 we decided to suspend the lightweight models as we felt the price premium was too great, but also not really enough to make it worthwhile for us. So, the saving quoted is based on the last price we charged, but really it should have been more than that. (not shown) First one made, a few kilos lighter than a standard boat because it has no buoyancy tanks (we hadn’t tooled them). Instead, there are removable solid teak thwarts at bow and stern, under which buoyancy bags (not included) could be fitted if you wished. All other woodwork is also in teak, to a very high standard, with chrome rowlocks. A lightly used boat, asking £1000 inc VAT. NYB17 Stowaway Kontender fold-flat 10ft dinghy. Built 2005, a high-spec, lightly-used example of the Stowaway Kontender – similar in size to a Mirror dinghy but folds flat for easier transport and storage. Options fitted include: the full rig (inc jib and bowsprit); two-position buoyancy bags that can be mounted inside or outside the hull for fendering and extra stability; solid transoms at bow and stern (covering the fabric); and hardwood gunwhales (in lieu of plywood). She is generaly in good condition for age but with some cosmetic scratching to hull/ seats – this would be easy to fix, and could wait until the end of the season if you’re in a hurry to get afloat! – Easier to Store and Shorter to Tow. The bow section folds over onto stern, reducing the length by 7ft, and providing a large stowage area inside. – Easy Launching. Just push into the water until it’s afloat, detach the towbar, get in, pull up wheels and go! – No trailer to park. – No Mooring Fees, and only 7ft long (instead of 14) to store at home. – Stable, unsinkable (foam-filled) hull, perfect for families or fishing. The Clamboat was developed in the UK in the 1990s, marketed for a few years, and then the moulds/tooling were bought by a company in Australia. More recently the design and concept came back to the UK, and although there were a few changes essentially the same boat is available today re-branded as the EzyBoat, with prices starting from £7995. The versatile hull shape can be rowed, motored or sailed. It can take outboards from 2.5hp, for quiet river cruises, up to 15hp if you wish to achieve planing speeds (no motor is included but we can supply at extra cost). It can also be rowed fairly easily (rowlocks included but not oars), and has a moulded daggerboard slot so you could add a sailing rig (no sailing rig components included). The Clamboat for sale here is hull number 42, built 2004 in the UK by Rondar Raceboats. It is generally in good condition for its age, but has clearly been used and has some scratches/chips in the gelcoat. It could be used immediately, but would benefit from some cleaning/polishing/filling of the glassfibre, plus sanding/ varnishing of the plywood centre seat and outboard bracket. It was towed over 150 miles to get it here in early April 2012, without incident, but the folding mechanism is a little stiff and would benefit from greasing (and probably most of all, being used). This is the hull we took the moulds from for our production pram dinghies. She is constructed from double-diagonal mahogany, sheathed in glass and epoxy externally, but with no internal fitout, and measures 8ft2″x4ft3″. We could help out with any of the fittings you might need to finish her off, from joining bolts and alignment hooks to a sailing rig. The outside is for the most part exceptionally well-finished – as you would expect from a hull that was used to make moulds – although there are a few chips that would need repairing (nothing difficult) where the mould stuck. The materials cost for this boat was over £1200, plus over 200 hours of labour… at our asking price of £1100 she is quite simply a bargain for someone with the appropriate skills to finish her. We imported this boat from the Canadian builders NestingLite in January 2010, with the idea being to show her over here, take orders and start production in the UK. 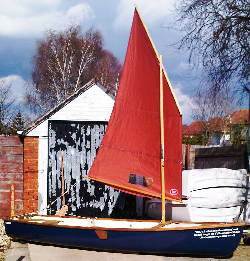 That didn’t happen in the end – not least because we developed our own 9ft nesting stem dinghy (click here: 9ft Clinker Stem Dinghy) – so our little-used evaluation boat is now for sale including sailing rig/VAT. 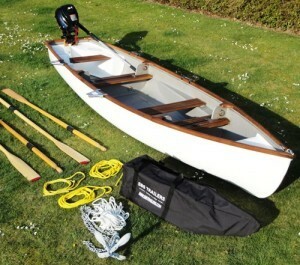 This high-spec carbon/Kevlar Pram dinghy with sailing rig was delivered to the customer earlier this year. Sadly, a change in circumstances means they cannot use it any more, so it is a rare opportunity to acquire one of these Prams ready-built (no waiting list) and at a significant saving on the price new. Specification includes: upgrade to carbon/Kevlar hull; upgrade to teak woodwork; two longitudinal seats in stern section; lug rig with tan sail, window and boom; keel wear strip in brass; bilge keels/handles on stern section; chromed rowlocks and 6ft 6″ oars; transom wheels; and Easybase towbar-mounted carrying platform. 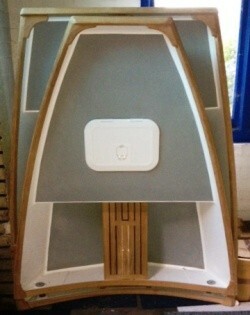 We delivered this teak-trimmed, glassfibre hull Trio last year, for use as a dayboat in Chichester harbour. The owners enjoyed her very much but have now decided to go for a bigger boat with a cabin for trips further afield. She is offered complete with: outboard motor, 7ft oars/ outrigger brackets (two pairs), anchor and folding launch trolley. She is generally in very good condition – the hull has just been re-polished in our workshops – with a few cosmetic scratches to the hull as you would expect of any boat after one season’s use (mostly on bottom where you don’t see them). – More visible reinforcement to the centre section floor than production version. The woodwork is Iroko and has been well looked after. The buoyancy tanks are as standard version, apart from the way the removable stern seat mounts (it is slightly less “integrated”). The hull is standard glassfibre layup and has been used, with some cosmetic scratching but nothing serious and virtually invisible being a white hull. 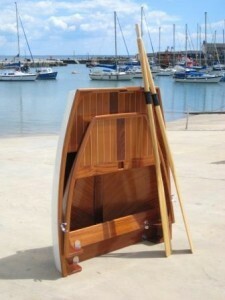 NYB3 Cold-moulded mahogany 8ft 8″ Pram Dinghy. 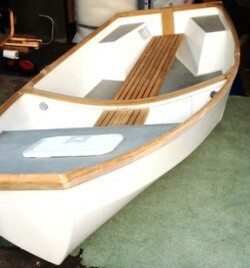 This was the original prototype for our current production glassfibre Pram Dinghy. She was built in 2008, using two layers of diagonally opposed mahogany veneer (each 3mm thick) with a glass/epoxy layer on the outside for abrasion resistance.